An outcrop informally named "Chester Lake" is the second rock on the rim of Endeavour crater to be approached by NASA's Mars Exploration Rover Opportunity for close inspection with instruments on the rover's robotic arm. This view of Chester Lake combines images taken through three different filters by Opportunity's panoramic camera (Pancam) and is presented in false color to emphasize differences among materials in the rock and soil. The component images were taken during the 2,709th Martian day, or sol, of Opportunity's work on Mars (September 7, 2011). Chester Lake is about 3 feet (1 meter) across. It lies on the inboard (southeastern) side of a low ridge, "Cape York," which forms a portion of the western rim of Endeavour crater. Rover team scientists chose it for inspection because it is in-place bedrock that appears to be representative of a region of outcrops on the inboard side of Cape York. Chester Lake differs from the first rock inspected by Opportunity on the Endeavour rim, "Tisdale 2," which is a boulder excavated during an impact event that produced a small crater on the rim. Both rocks appear to be breccia, a type of rock fusing together broken fragments of older rocks. 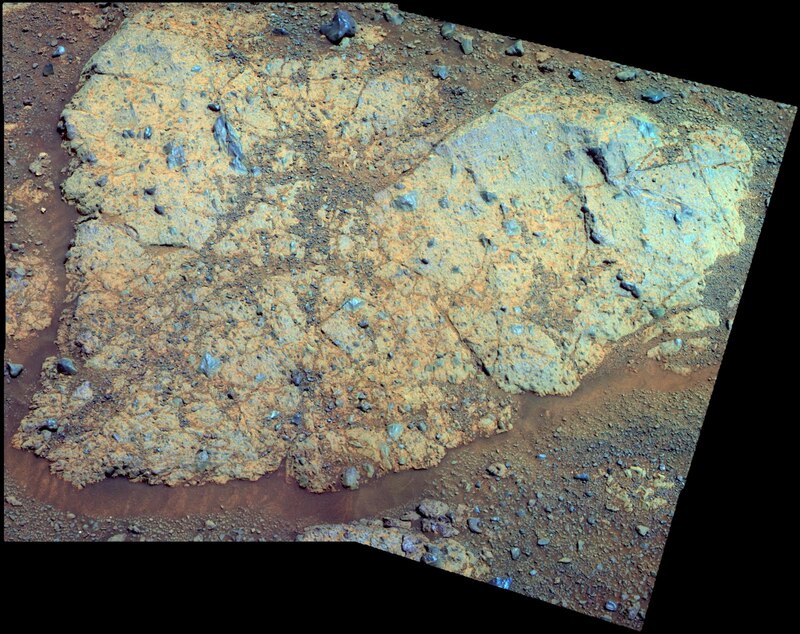 By Sol 2713 (September 11, 2011), researchers had used Opportunity's microscopic imager and alpha particle X-ray spectrometer to study Chester Lake and were planning to use the rover's rock abrasion tool and, possibly, its Moessbauer spectrometer on the rock. They will use all the data to reconstruct the chemistry, mineralogy and geologic setting of Chester Lake, including evidence about whether or not the rock has any clay minerals in its composition. Images combined into this view were taken through Pancam filters admitting light with wavelengths centered at 753 nanometers (near infrared), 535 nanometers (green) and 432 nanometers (violet). Note: For two other pictures of Chester Lake, see PIA14751: Shadow Across 'Chester Lake' on Endeavour Rim, Sol 2710 and PIA14753: 'Chester Lake' Bedrock on Rim of Endeavour Crater.